Metal oxides with a wide band gap, such as Titanium Dioxide, absorb and reflect UV energy from the sun’s radiation. This makes them useful as UV filters and as pigments in the cosmetic industry. Unfortunately, they are also photo-active, promoting the formation of reactive oxygen species and catalyzing the decomposition of organic materials. This is not desired in personal care applications, where the protective functions of these organic compounds are needed. Commercial surface modifications available to date have not eliminated this degradation, so a new means of protection was needed. HallBrite® EZ-FLO TDX was developed to highlight the benefits of photo-protected Titanium Dioxide with an industry-leading mineral UV filter aesthetic. This was achieved by leveraging a patent-protected C3+ coating system consisting of silica moieties, alkyl groups and polydimethylsiloxane with Hallstar’s photostabilizer technology. 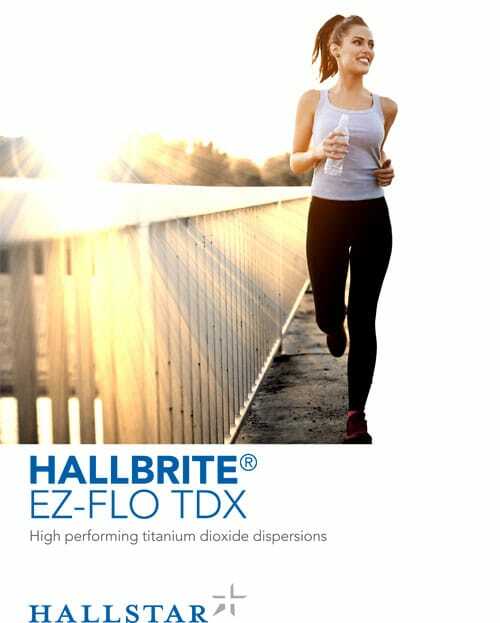 HallBrite® EZ-FLO TDX is an easily pourable, highly stable (45°C) dispersion of 40% Titanium Dioxide (nano), coated and dispersed in a carrier containing HallBrite® BHB (Butyloctyl Salicylate), with no particle perception and minimal whitening in use. It may be used as the sole UV filter source for SPFs up to about 30. When combined with Butyl Methoxydibenzoylmethane (Avobenzone) and Ethylhexyl Methoxycrylene (SolaStay® S1) or with Zinc Oxide (nano), broad spectrum protection can be achieved to SPF 50. HallBrite® EZ-FLO TDX shows how mineral UV filters can be easy to work with and also provide nice feeling, low whitening, high performance sunscreens for customers. Recommended use levels are up to 10% for Canada, 14% for Australia and 20% elsewhere, including China.